The beauty of using crushed spices is that they are ready to simply add to your cooking or sprinkle over a finished dish. 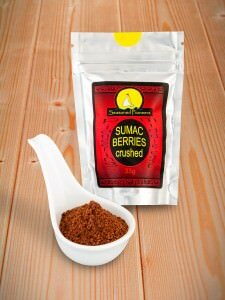 Our best-selling crushed spice is Sumac, a vibrant red Middle Eastern spice with an intense lemony flavour. The berries from the Sumac shrub are dried and then crushed, ready for use in a multitude of ways. They are also an integral ingredient in the classic Middle Eastern seasoning blend known as Zahtar or Zaatar. When you buy crushed spices it is important to check the ingredients as you want to be sure that the crushed spice is 100% spice with no bulking agents added. If you order crushed spice online from Seasoned Pioneers, you can be completely confident that you are getting unadulterated pure spices that never include any hidden ingredients. When producing crushed spice commercially the coarseness of the end product can be predetermined by the use of a series of meshes that gradually decrease in size. The crushed spices are passed through these and selected when they are at exactly the required size. Any resulting finer particles that pass all the way through the mesh system can be further ground into a spice powder. We offer our products in a variety of formats so that you can choose to buy whole, ground or crushed spice online. Differing recipes may include whole ingredients or ingredients that have been milled or crushed as the choice will have an impact on the flavour and appearance of a finished dish. We hope that when you buy crushed spice from Seasoned Pioneers you will be impressed with the alternative formats of spices and herbs that are available to order.